It isn’t coming up on the US site yet, but you can take a sneak peek on Louis Vuitton Japan. I really do love that Louis Vuitton is getting back to what made it a great company- the focus on travel- the “Journey”. This is the most recent installment of Louis Vuitton’s Core Values Campaign. LV/Marc Jacobs have pulled together a Motley Crew for these spots. 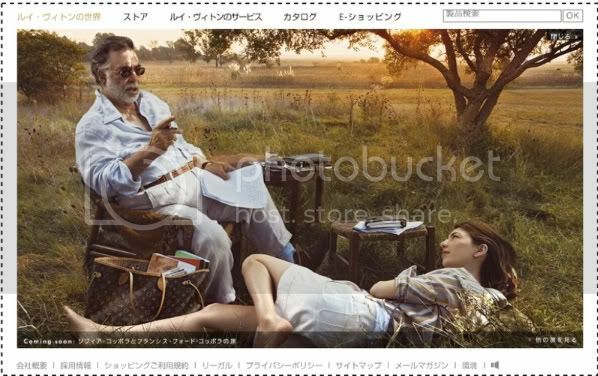 We’ve been graced with learning more from Louis Vuitton on the Journey’s of Keith Richards, Steffi Graf, and Andre Agassi so far, are Sofia and Francis Ford Coppola.